I feel so fortunate to be an orthodontist in a wonderful community! I look forward to having fun at work every day, while making a difference in the lives of a vibrant, healthy, and committed group of patients. The come to me because they want to, not because they have to, and I love the hugs and smiles that I receive! I love seeing a person blossom with new confidence and self-esteem as a result of a new smile. Orthodontic treatment can be a truly life-changing experience and I have seen it make such a difference in so many lives, from physical changes that improve health to aesthetic changes that improve self-worth. My greatest satisfaction has been watching numerous patients pursue dentistry as their own profession and a couple have gone on to become orthodontists, themselves. It is such an honor to know I had a positive effect on these lives! I have been involved with dentistry since 1980 and orthodontics since 1984. When I was a junior in dental school, two students who excelled academically and were clinically advanced were selected to join the Orthodontic Honors Program. As one of these students, I was able to see my own orthodontic patients as an undergraduate and it fanned a fire. That fire had started years earlier, when I worked as a lab assistant in my father’s orthodontic office, but the honors program made me realize I shared my father’s passion! I was a Clinical Professor in the Department of Orthodontics at Loyola University from 1989 to 1992. When I was teaching, I felt that being in an educational institution kept me up-to-speed on the latest research and clinical techniques. When Loyola closed, I became a Diplomate of the American Board of Orthodontics and joined numerous study clubs to stay on the leading-edge of emerging research and technology. 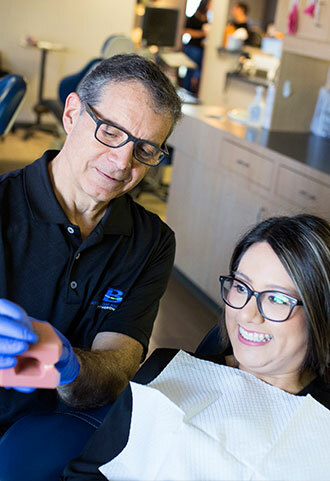 The rapid changes in orthodontics require me to take as much continuing education as I can, in order to provide patients with the best care options. Born in Chicago and raised in the western suburbs, I have lived in La Grange since 1988. My wife Grace and I met in college and married in 1981. We have three children and three grandchildren, to date. Our oldest, Ryan, is married to Taryn and has two daughters. Our middle child, Laura, is married to John – who is my business partner as well as son-in-law. They have a daughter, Emma. John, our youngest son, was lost in 2012 and is missed every day. Over the years our family has had our share of dogs, rabbits, and other pets. Presently, Grace and I enjoy travel, visiting friends, golf, and other activities that keep us from adding another pet at this point. The freedom is fun! I love outdoor sports. In the summer you’ll find me playing golf, water skiing, biking, or any other reason I might find to be outside! Winters I love to spend snow skiing and snowmobiling, along with playing platform tennis. I am a private pilot, too, and still love to fly, and I do a bit of amateur auto racing as well. Grace and I love to travel and explore; any excuse to be with family and friends is always embraced!